Macaws are known as the giants of the parrot world. Macaws are known as the giants of the parrot world, and the hyacinth macaw is the longest parrot, with a head to tail length of nearly 40 inches. Macaws have long tail feathers as well as big beaks. Their large, curved beaks are quite powerful and are designed to crack open hard nuts and seeds. Macaws have a long, streamlined physique and colorful feathering, ranging from the hyacinth’s macaw hyacinth blue to the scarlet macaw’s scarlet red coloring. Some macaw species have bare facial patches. Macaws are informally classified into two groups; large macaws, which include those of the Ara and Anodorhynchus (the “blue macaws,” including the hyacinth and and critically endangered Lear’s macaw) genus, and the much smaller mini macaws, which include macaws of the Diopsittaca, Orthopstittaca and Primolius genus. Besides being highly intelligent, Macaws have outgoing personalities and are very social. They adapt quickly to their cage and playpen, or aviary, and are quite playful. Their personality is such that they will form a close, loving bond with their keeper, and become a life-long companion. An important question, that is often misconstrued, is how long do Macaws live. Because of their large size it makes sense to think they would be very long lived, but the actual Macaw lifespan is between about 35-60 years in a good environment. They are easily outlived by the large cockatoos, and often by medium sized parrots like the Amazons. The Blue and Gold Macaw Ara ararauna is currently considered a monotypic species, meaning that it contains only one species. However, taxonomy is an ongoing science, and as experts learn more it could change. Macaws are native to the southern portion of North America (Mexico), Central America, South America, and there is evidence that the Carribbean also had native macaw species, which are now extinct, such as the Saint Croix macaw. They inhabit rain forests, as well as more grasslands and grassy woodland-type areas. Macaws, and other parrot species, native to the Amazon basin, such as Peru, have been observed eating from clay licks (clay from exposed river bank), which researchers believe is a way for the parrots to neutralize toxins found in some of the foods they consume in the wild. The Blue and Gold Macaw (Ara ararauna) is one of the most beautiful large parrots. It is a sweet tempered and affectionate parrot, and has one of the best all around personalities of the large Macaws. This bird makes a great companion for a single person. But it is friendly with everyone, including other birds, when it's well socialized. Although some Macaws are one-person type birds, the Blue and Gold is right at home in a family type situation as well. Macaws are a force to be reckoned with. Everything about them is big, from their voices to their attitudes. Even the mini macaws are big … on the inside! Colorful and often raucous, they call attention to themselves even when quiet. Although, to the uninitiated, macaws seem formidable and may bluster and carry on, those who share their lives with these magnificent friends know that they contain surprisingly soft and loving hearts and sensitive natures. Macaws can be quite playful and love toys they can chew up, especially items made of wood. A pet macaw will need a consistent supply of appropriate toys and other safe items to destroy, and the cost of a staple supply of toys should be factored in to the monthly pet budget. Macaws are intelligent birds that also thrive on activities designed to challenge them, such as foraging activities. A macaw might make a game out of spooking people by leaning forward and lunging toward them, not as an aggressive gesture but more for the reaction it causes. In general, a well-socialized, positively interacted with macaw can be a gentle pet. Macaws from the Ara genus, such as green-winged, scarlet and blue-and-gold macaws, have a bare facial patch, which turns flush when the bird is overly excited. A roomy cage is required, at least 2 1/2 by 3 feet. Because Macaws can be quite vocal, be sure the cage is in a room where the amount of noise the neighbors hear is a minimal as possible. A large sturdy perch needs to be mounted in the cage. Fresh fruit tree branches work great because they can chew on them as well, but then they will have to be replaced occasionally. Food and water dishes, along with a treat dish work best mounted above the perch at the side of the cage. A variety of toys for playing and chewing should also be provided. As alternatives to a cage, they can be kept in an outdoor aviary where the weather permits, and some people like to provide their bird with its own "bird room". These Macaws need 2 - 3 hours a day outside their cage. The Macaw's cage is their territory and a play pen top is great, but it is still their territory. It is better to interact with this Macaw on top of a sturdy perch away from the Macaw cage. A separate, free-standing playpen works great for this. Sometimes they will get down and just walk around looking for you. But usually once they hear you they will walk directly toward you. Many birds can spend most of their time on a playpen or parrot perch. Should have access to a large enclosure (15 m (50 ft) long) in which to fly for part of the year.A macaw needs a cage tall enough to prevent its tail feathers from hitting the cage bottom, which can cause the tail feathers to bend or break. Overall, a macaw needs a much larger cage and play stand than other parrot species, so a potential owner should take space considerations into account. In their natural habitat, macaws feed on native seeds, fruits, flowers, leaves, palm nuts, figs, nectar and, in some regions, clay from exposed river banks. The dietary needs of some macaw species differs from that of other parrots in that they need generally more fat in their diet. The wild macaw’s diet tends to be high in fat, which is acceptable for a bird that spends its day flying through the rainforest, finding food, nesting, and rearing chicks. Companion macaws tend to have a much easier life than their wild counterparts, but they miss out on the ability to forage for their food, a behavior that comes naturally. Lafeber’s bird foods are ideal for the lively macaw, a bird that appreciates the opportunity to tear apart its meals. Macaws tend to love Pellet-Berries, Avi-Cakes and Nutri-Berries. Large macaws have equally large vocalizations, and their squawks and screeches can be very loud and ear piercing. 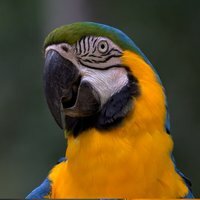 A potential macaw owner needs to take a macaw’s large sound into consideration, especially if he or she lives in an apartment and/or has nearby neighbors. Macaws can be taught to talk and they might also be inclined to whistle or to imitate sounds and noises they hear inside and outside the home. The Blue and Gold Macaw adapts quickly. Once it becomes accustomed to a new environment and its keeper it is then ready to start bird training. Generally though, you should give a new arrival a few days to get use to you, your voice and its cage before trying to handle it. A hand fed baby will not need much taming and can often be handled right away, as it is use to human attention. Captive breeding in the United States has occurred since at least 1935. The Blue and Gold Macaw has been known to breed at as young an age as 3 years. Their lifespan for reproduction is long, several decades. The usual clutch consists of two or three eggs which incubate for about 28 days. The chicks will stay in the nest for about 3 months and are quite large when they fledge. Feed the parents plenty of green stuffs, corn-on-the-cob, carrots, protein, and fruit laced with food supplement while they are rearing the youngsters. This Blue and Gold Macaw has also been crossed with other large macaw species to develop a number of hybrid Macaws. These include first generation (F1) hybrids like the Bluffon's Macaw, Caloshua Macaw, Catalina Macaw, Harlequin Macaw, Maui Sunset Macaw, and Miligold Macaw, and second generation (F2) and later generations hybirds such as the Blue and Gold Macaw x Calico Macaw, Catablu Macaw, and Harligold Macaw. It has not been hybridized with Mini Macaws. It is said that the males head is flatter and the females head is rounder, and the female beak is narrower than the males. However, There is no for certain way to distinguish the male Hyacinth Macaw from the female. In order to know whether you have a male or female, the bird must be sexed. DNA / Feather or surgical sexing is recommended. Macaws can be prone to feather-destructive behaviors. If a complete medical exam rules out medical causes of feather plucking, boredom and/or lack of appropriate mental stimulation can be a cause. Offer your macaw an enriched environment with plenty of opportunities for play and exercise, such as a climbing nets and ropes, in addition to toys. Macaws are also more susceptible to Proventricular Dilatation Disease (PDD), Psittacine Beak and Feather Disease, Psittacosis, beak malocclusion and Aspergillosis. Regular health checkups by an avian veterinarian can help diagnose and treat many disease processes early on. It is normal for a macaw to sneeze a few times a day to clear out dust or dander from its nares, which might be accompanied by a clear discharge. If the sneezing is persistent and/or the discharge is not a clear color, contact your avian veterinarian. If you notice any of these bird illnesses in your Blue and Gold Macaw immediately provide a warm, draft free, secure environment kept at about 86°F (30°C). Place food and water close to the perch where it is easily accessible. An ailing parrot should be taken to an avian veterinarian for diagnosis and treatment.